The benefits of tele-monitoring are evident, especially for some diagnoses. But the theory behind tele-monitoring and the realities of dealing with tele-monitoring have a gap in-between them. How to over-come the gap and bring real value is the question. More and more hospitals are taking the initiative and putting recently discharged patients with CHF, Diabetes and hypertension, heart failure on home telemetry. Patients get a scale for daily weight, a BP monitoring kit, a glucose monitoring kit, and a finger O2 tool. Patients using an IPad using blue tooth wireless technology and a simple script of daily questions and recording of the daily vitals rounds out the daily routine. Being able to daily monitor patients with chronic diseases potentially gives home health nurses a mechanism for catching problems before patients go to ED and are admitted. 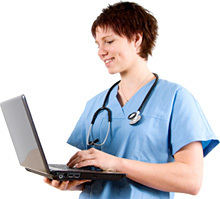 The daily data is transmitted to a nurse in a room at a local hospital who sits and looks at daily readings. ENTER THE GAP. While the development of the technology was indeed a huge step; the efficacy of the tools is only as good as the people reading the findings and reacting to them. One of the biggest first hurdles is getting the patients (often elderly) to use the tools. But the learning curve doesn’t begin with the patients….it actually begins with the home health nurses. To the extent they are comfortable with the equipment and can teach the patient to feel that same comfortableness, to that extent the patient will comply. This step cannot be over-emphasized. The first exposure to new technology is often either the barrier between patients and communicating the daily vitals or the bridge to success. In study after study, a weight gain of just a couple of pounds over 2 days for CHF patients indicates a buildup of fluid. Being able to trend weight over time helps to monitor medication that will help patients get rid of that fluid; but is meaningless if patient does not take an acceptable daily weight at the same time every day. If education is the key to success, then follow-up is the key to education. Patients need feedback to ensure their compliance. Taking time to educate, explain, show and teach patients will reap huge rewards if done properly. The second part of the gap is after the data is received. Collecting the data is great. Now what do you do with it? The whole point of tele-monitoring is a more timely attention to the subtle daily changes that may lead to re-admission. Reacting to the data must happen as the changes are seen. Here’s an example: an 88 year old CHF patient is discharged on 40 mg of Lasix daily. Tele-monitoring is installed in home and patient is compliant taking daily readings. Over two days 3 weeks after discharge, a weight gain of 3 pounds takes place. A daughter looking at the daily recorded data calls the doctor and the Lasix is increased to 80 mgs daily. The weight gain falls back to normal. Three days after increasing the Lasix, a nurse call from the data center to tell the patient the weight gain could mean retention of fluid. Too little too late as the saying goes. Had the nurse called on the 3rd day of the weight gain, that would have filled the gap and the patients well-being would be well served. As it was, she called almost a week after the incident. Technology is great. Having the right plan to analyze and react to technology is even better.